The main job of the respiratory system of birds is to absorb oxygen and rid the body of carbon dioxide. In addition, the respiratory system also gets rid of excess heat, detoxifies some of the waste products of the body, and makes noise — most noticeably, crowing noise, much to the annoyance of our neighbors. Like humans, birds have a windpipe and two lungs, but from there, birds are distinctly unlike mammals. Air flows into a bird’s lungs during the intake of breath, it continues through the lungs into nine air sacs, and then it goes back out through the lungs again. Birds get two doses of oxygen for the price of one breath! 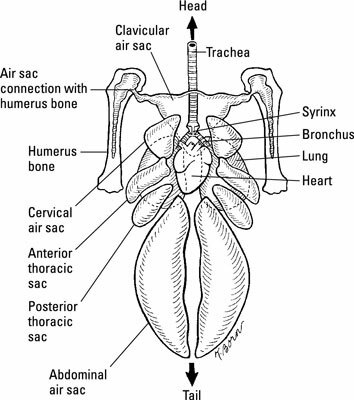 The air sacs are arranged around the inside of the chest and abdominal cavity, and they connect with some of the bones of the skeleton. Humans breathe with the help of the diaphragm muscle, which divides the chest and abdominal cavities. Birds don’t have a working diaphragm; instead, a bird moves its rib cage and keel (breastbone) to draw air into the lungs and force it back out. Holding a chick or other small bird firmly around the body stops them from breathing, and it may quickly kill them. This is just one of several reasons why small children should be supervised when holding chicks. The voice box in chickens is called the syrinx, located down in the chest cavity where the windpipe splits to enter each lung. Both male and female chickens have a syrinx, so hens can crow, too, if they feel like it. The syrinx isn’t an optional piece of anatomy though. A rooster can’t live with his syrinx removed. The layout of a chicken’s heart isn’t so different from the layout of a human heart. It has four chambers and pumps blood through two loops: one loop through the lungs, and the other loop through the rest of the body. A bird’s heart is relatively large for its body size, compared to mammal hearts.